On Friday the 13th (October 2017), a bunch of us checked out A Petrified Forest located in Altamonte Springs, FL. I had never been, even though this was their 10th year and it was relatively close to where I live. That being said, I am kicking myself for never checking this out before. 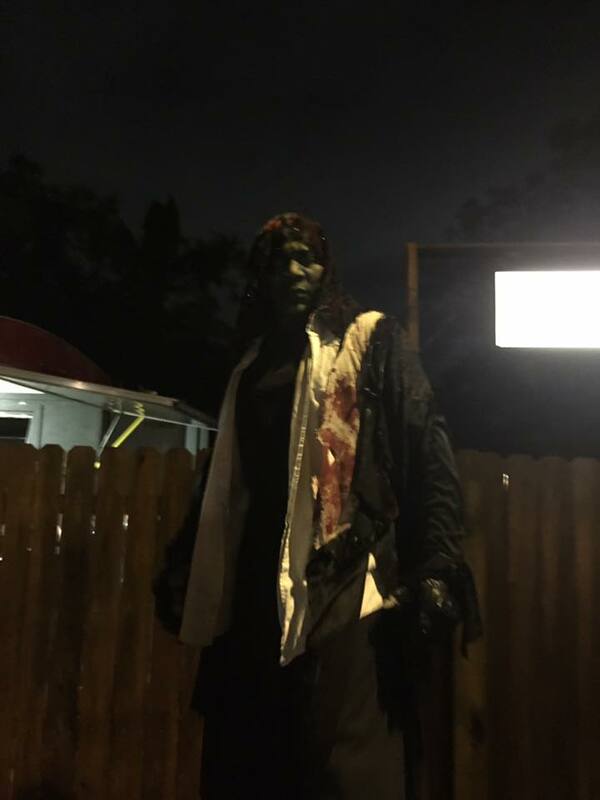 They sell multiple packages ranging from a 1 trail experience for about 12 bucks, to a VIP ticket ,which allows you to go on both trails and even go backstage to get a chance to scare some of the attendees, which cost around 50 bucks. They even have a “Total Eclipse” option on a few select days where there are no lights on and attendees each get 1 glow stick to see their way around. There was 11 of us in all and we opted for the 2 trail ticket which were $27.00 each. It was raining really hard that night which, to me, added to the experience. Plus, the rain stopped just as we got in line to get into the area where the trails start and didn’t start again until after we finished both trails. The “trails” actually start in a house much like you would find at Halloween Horror Nights. You walk through the houses, which lead outside and onto the trail. We had to break up our party into groups of 5 and 6 to go through. This was fine with everyone, as it probably made it better to have a smaller amount of people going through each trail. Inside the first house, there were actors set in the different rooms, jumping out at you, yelling or whispering to you, holding dolls covered in blood, and all other kinds of really cool stuff. Then, you go out the back door and are on the trail. People would grab you from behind, at your feet, or get right in your face (which was awesome). There was also an area where they had green lasers and a fogger, which gave the impression that you were walking through a swamp. That was the coolest effect, in my opinion. I was also impressed by the amount of actors that they had in each trail. They seemed to be everywhere! There were some who were even above you, walking or crawling with you as you went through. For the second house/trail, you get into a cart that is on tracks. It goes about 50 yards before stopping, moving you on to the “house” part. This had more people inside creeping you out, and when you get to the back of this house to go out to the trail, you couldn’t open the door. Then, a guy dressed as a gunslinger jumps up, walks towards you, and slams the door open to let you outside… without saying a word. This was a nice touch and definitely had an effect on a couple of the people who were with us. Again, the outside portion was really well done. Going over small bridges and walking through the woodsy area on a dark and very damp night gave it a little more of an authentic Halloween feeling. I must say, I was very impressed by the length of the trails. Of course, I wanted them to be longer, but that is just me being me. Each house/trail was 10-15 minutes long and the best part was, no one rushed you to keep moving… You could take your time and enjoy every facet of the trails which was very nice. The actors were great and pretty creepy. There were several times where the jump scares rivaled what I have experienced at HHN or other “haunts”. The fact that we went on a rainy Friday the 13th was an extra bonus that added to my enjoyment. I highly recommend this attraction for anyone within a reasonable driving distance.